This is what Mum really wants for Mother’s Day. 1. A sleep in or, failing that, a rest during the day. Preferably both. And preferably with no one asleep on her head. 2. A hot beverage to start the day and a cold beverage to end the afternoon. Bonus points if the hot beverage (coffee or tea thanks) is complemented with a yummy breakfast and the cold beverage (wine for me, thanks) also comes with a cheese platter. 3. For her children to pick up after themselves. It’s a big ask, I know, but for just one day, it would be nice to not pick up a single toy, item of clothing or piece of half eaten toast off any surface. 4. A hot bath alone. Unless the above man would like to join. He is invited. 5. For her kids to remain relatively clean. If this means living under the backyard hose for the entire day, then go for it. As long as the laundry pile is reasonably low,, the amount of sand in her children’s hair is at zero and the levels of dirt in the bathtub is down, then she’ll be content. 6. For everyone in the household to get along. No squabbles over who has the green cup. No arguments over who gets to hold the television remote. No battles over who gets to sit on the left side of the car. Choose your poison – washing, scrubbing, doing the dishes, cooking a meal. Take a chore away from Mum and you’re kicking goals. 8. A handmade card crafted with love (and possibly so awesome that it can be framed or placed in the prime spot on the fridge). Or at least one that is so shockingly awful that Mum gets a laugh out of it. 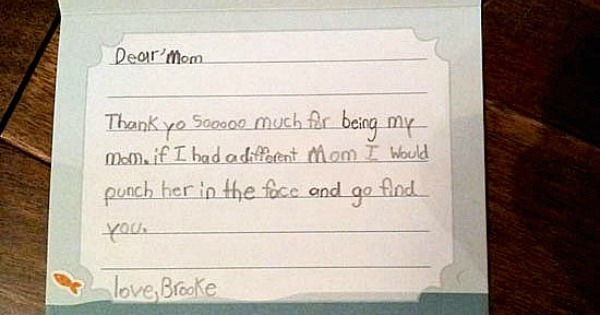 Check out our very favourite awkward Mother’s Day cards from last year. 9. A full day of good manners. This means saying please and thank you, doing what you are told the first time you are asked and keeping all bodily function noises to yourself, or at least away from the vicinity of the dinner table. Another big ask, I know, but it’s only for one day! 10. The assurance that, yes, she is doing a good job. 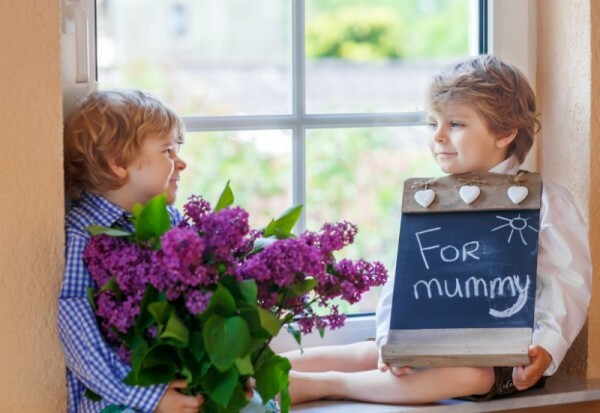 This is what the day is all about – appreciating the little things that mums do each and every day. So shower her with kisses and cuddles. This is the best gift a mum can get.